Recently, I was involved in a discussion on Facebook about rank in the martial arts, part of that discussion concerned whether it is a professor’s responsibility to add to the arts. First, let me give you my definition of Kenpo. Kenpo is a philosophy of motion. The word philosophy means “The love of wisdom”. 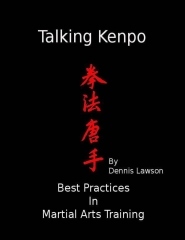 The word Kenpo is translated as (Fist Law) so; Kenpo is The Love of the Wisdom of the Law of the Fist. Ed Parker used the analogy of learning a language when describing what it was to study the Martial Arts. There are alphabets of motion; which are the basics. The basics are put together to spell words of motion; small words at first like “Cat”, then larger ones. We learn first by being shown how to spell, then by repeating the specific word again and again. After we learn to spell specific words (motions) we are taught sentences of motion, paragraphs, and finally stories. The sentences could be likened to freestyle or self defense techniques, the paragraphs to longer more sophisticated techniques, and the stories to forms. Like the forms in Kenpo, a good story teaches a lesson or, often, more than one. The lessons we learn teach us the principles of the language of motion --- Kenpo. These lessons are the Principles of Motion and Principles of Self Defense. After years of practicing the basics, and then more sophisticated basics, we come to a level, where in a physical sense, we speak the language. The language of motion called Ed Parkers Kenpo. But being able to speak a language and teach someone how to speak a language and to write in that language with proper grammar, punctuation, decent spelling and clear ideas are very separate things. Similarly, there is a difference between an elementary school teacher who teaches the basics of a language to their students and a middle school teacher who introduces a student to different literatures. By high school, and certainly, college, a teacher must require students to interpret stories, seeking the author’s meaning, and to write stories of their own. A professor of language or any literature must first and foremost be a reader. They have need of a deep knowledge of the rules of the language and the stories they study, both their content and meaning. And, finally, they are writers. Let me repeat, they are writers. They add to the knowledge base about their specific area of study. It’s the writing part that is important in this analogy. Up until the point that one begins to write, a student or even a teacher is just a scribe. They may be a very good scribe but still, they are just copying. When a professor adds to the art they have achieved a level of mastery of their language that allows them to write fresh stories. They don't change the language but they use the language to add to the breadth of literature. Part of the genius of Ed Parker was that he created a language of motion. He refined that language throughout his lifetime. He wrote a staggering amount of material on the subject, books, manuals, along with sayings, stories, etc. Anyone who has earned the rank of associate professor (5th Degree Black Belt) has a responsibility to add their own stories. The next question is when a professor does contribute to the “literature” of Kenpo, who is to judge the quality of their contribution? There are two perspectives for judgment, the consumer and peer. Good consumer review is dependent on educated consumers. Most people who walk into a Karate school for the first time aren't educated about the martial arts. They may not know the difference between good self defense training, exercised with logic and economy of motion and entertaining, flashy movie martial arts that might get them hurt in a real self defense situation. So that leaves us, as artists, with peer review. Peer review is the way that we move through the ranks of martial arts. Black belts who have gone through a similar process of learning and review are asked to sit on our review board. This process may be fine while we are still learning to mimic the language we are learning. What happens when a person reaches a level of mastery where they are supposed to be adding to the Art/Language? How can a contemporary or any review board judge their contribution? Only a contemporary (read senior rank) who is publishing, or working consistently on projects that have to do with a refinement of the language/Art, could offer an educated evaluation. Research projects and publications might involve: best practices for teaching, learning modalities, scientific understanding of how the body moves most efficiently in space, kinesiology, new or revised terms requiring precise definition, best practices for professional martial arts businesses, best practices for teaching children, best practices for physical fitness in the arts, methods that promote lifelong fitness, and healthy, safe training methods. These are just a few examples. If these kinds of research and development projects are not required for professorship, what is? If the requirement for professorship is based on time in the arts or the ability to repeat the whole syllabus of motion without an emphasis on understanding “why” the syllabus exists in the first place, then professorship becomes just a title held that bears little meaning. It is another in a long line of ego driven accomplishments that exists solely for the title holder’s gratifications. This type of “professor” furthers a tradition of students who strive for rank, position, or power over others; but not understanding. For those of a practical mind, it should be the other way around. Remember that Ed Parker said that what defined an Ed Parker Black Belt was “Logic and Basics”. Anything less is Fool’s Gold.